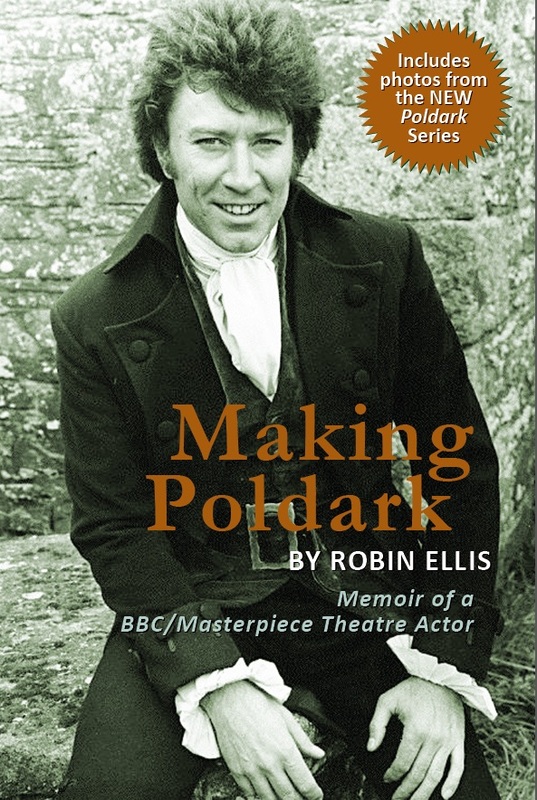 Robin Ellis’ newly updated memoir Making Poldark is has a fresh chapter about his involvement with the new BBC/Mammoth Screen adaptation of the Poldark saga in which Robin plays the grumpy Rev. Dr. Halse. The book features photographs from Winston Graham’s personal Poldark album and photos from Robin’s own private collection—including all-new photos from the 2015 Poldark shoot on location in the West Country. Hugely popular in the US and UK when it first aired in the 1970s, the original series remains a favorite on DVD, entertaining and enchanting new generations of viewers in 40 countries throughout the world. The new BBC1 version, airing now in the UK, has been a huge success, touching off a wave of Poldark mania and making a star out of the new leading man, Aidan Turner. This updated edition of Making Poldark is available on Amazon. beautiful place. It was to beautiful for words. I purchased several books about the Poldark series . So i was delighted when the updated book came out. It was a wonderful vacation and Poldark was and is my favorite mini series of all time. Of course, i purchased the dvds. great series even for today. Does Warleggan have a book? I have just bought the updated version, too. I can’t believe I am telling you this at my advanced age, but I absolutely loved Poldark. I have every book, the complete series VHS, now must get dvd, and I have a poster of Ross that is STILL on my bedroom wall after all these years. I used to live near Stratford and saw all your performances, the best ever production of ‘Much Ado’, I have never seen it bettered, and the unbelievable musical version of ‘Comedy’, which I also have on both vhs and dvd. I travelled to Newcastle to see ‘Comedy’, and have a straw hat which was thrown off the stage also hanging on my bedroom wall. When I was in my car at Stratford, I saw you come out of the theatre, cross the road in front of my car, putting your hand on the bonnet. I didn’t wash it for ages. Happy daze! And Poldark is STILL as popular and great as ever. Thanks Joy–Stratford was a heady time. As hot that summer as it is today here in SW France. We had a terrific season–made sweeter by the critical pummeling the newly opened National Theatre on the South Bank was taking! I didn’t know Comedy is available on DVD. We will order it. Take care if it’s as hot there as it is here! Hello Robin, Paul Blake from Highgate (Ingleholme and Eastgate) here. Last saw you in Edinburgh years ago. Watched The Europeans last night after all these years and thought that I must try to contact you again. Best wishes from a fellow diabetic now in Cheshire. Hello Paul! well well the wonders of internet.Best wishes to you too. I have a photo–I think it’s in a post–of the show done in Ingleholme called Captain Blood. Rodney Brody and Michael Webster are in it. Perhaps you too. Hope you are doing OK with your Type 2. Hi Robin, Enjoying your blogs. Just a quick line to tell you that the Director of a film crew that has been shooting in my kitchen ( not one of my films, but being produced by an associate) spotted, on my bookshelf, a pic of you as we were looking for book props; it was a Poldark paperback. “Hey you see this fellow here” he said,”I know him, In fact I nearly ran him over years ago as we worked together on a voice over gig for Fiat!” I told him that many fans around the world would never have forgiven him if he had!The Director is Craig, from Glasgow; a lovely man. He’s here in Australia for a few more days before heading to NY. He asked to be remembered to you & apologises again for almost killing you! Thanks Teni! I rode a 1938 Raleigh bicycle to VO gigs in those days–dangerous but more reliable in London traffic! I had a few scrapes–black cabs didn’t like me much–but I don’t recall a near miss with Craig. If you have contact again–say hi! from me and all is forgiven! Love your series Poldark so much I another third viewing. Did you know there is talk of a re-make of Poldark by tHe BBC. Thanks, Colin–I did hear tell! I’m not surprised it’s a great story/saga. Hello Mr. Ellis, just to let you know that i am forever watching both series. Question. How tall is Captain MacNeil? Hello, Robin, I have been thinking about Poldark lately and among other things google turned up is your website which I find makes me very hungry. I thought your fans and perhaps you would enjoy a little story I have. I think the year must have been 1978. My wife and I had been immersed in Poldark via Masterpiece Theater on PBS for some time. It was certainly our favorite show at the time and one of our all time favorites. I was at the time teaching psychology at Mississippi State University. Coincidentally you and I were both born in 1942, grand year that it was. Perhaps that’s part of the ease of identity I had with the character Poldark. Cut to Chicago in probably November, 1978. We were both 36. I was attending a meeting of the Association for the Advancement of Behavioral Therapy. I had wanted to visit the Sears Tower while I was in town but none of the crowd I was with at the meeting wanted to go so country boy me takes on Chicago alone and takes the short horizontal ride and the long vertical ride to the observation deck at Sears Tower. The way I recall it I had walked all around the viewing area and had sat down to catch my breath and do a bit of people watching before heading back to my hotel and some meeting or other. Suddenly and very dramatically a man gets off the elevator and strides my direction clearly looking for someone. My first though is “I know that guy, what the heck is his name, is he looking for me?” The guy, apparently not seeing whom he was seeking strode just as purposefully the other way where he could peer down another hall where people were sitting. The two halls were connected so that I by moving only a bit could continue to watch this purposeful man with such a stride, such an intense look, in a phrase such a totally commanding presence. “Who is it?,” I continue to say to myself, “I know that guy and I know him well.” The man strode back the other way looking again down the hallway where I was sitting. I thought, “I will never forgive myself if I don’t approach this man and find out where I know him.” So I did. Poldark was so popular that I have loved telling this story, although it’s been awhile. I never expected to tell it to you but am glad to find us both healthy and alive, nearing vintage. I don’t think my wife of 40 years was ever sure I was telling the truth, but, of course I was. Cheers. Robert L. Hudson, Mountain Home, Arkansas. That is priceless Robert. I have dined out on being recognised at the top of the Sears Tower for years!–though I haven’t remembered the details as well as you. I can now augment the story with your account–pretty amazing stuff, thank you! I was with Meredith, who was born in Evanston, at a store in the John Hancock building, another iconic Chicago landmark building. I had the feeling I’d been recognised. At the checkout the owner said to me “We are so happy to see you in the store today. Would you be so kind as to give us your autograph? I must tell you that every Sunday night we close the store early just to be sure, because we’d hate to miss one episode of Dr Who(!)”. Meredith says I signed without blinking and everyone was happy! Fame is fleeting! Many Doctors Who; only one Poldark! I love how you both spoke in perfect Poldark English at the top of the Sears Tower. Wonderful. I love how you are both spoke in perfect Poldark English at the top of the Sears Tower. Wonderful. Thanks, Rod for the invitation. Not sure what I would talk about and I’m not a public after dinner speaker–I might prefer to eat beatles! Anyway I’m flattered to have been asked, thank you. I watched the series way back when and introduced it to my hubby. We just finished watching the two series last week. Wish there had been a third. My husband was wondering why it was never produced. Maybe we need to buy the book to find out, or maybe it’s already in this blog, but just wondering. An account is in Making Poldark, Maureen. Just finished Poldark 2, for a second time. I forgot that it ended, not so much as a cliffhanger, but with the obvious intent to make a Poldark 3. It therefore joins the sad company of other highly enjoyable British series such as Berkeley Square and the House of Elliot, which also appeared to end with at least one more series in mind. Looking forward to reading Mr. Ellis’ book! There is a little Making of Poldark pamphlet in with the Poldark 1, and I hadn’t picked it up yet, since I couldn’t remember everything that happened, and wanted to wait until I was finished watching both series. Therefore, I am VERY pleased indeed to see that there is a full-length book. Best wishes to you, Robin, and to Meredith, and to the entire feline contingent! I am going to order the memoir from my local bookstore, and look forward to trying out some of your recipes. Thanks for the kind words, Laurie. Dear Robin, I would love to find your book here in the USA. I’m a huge Poldark fan since the 70’s when I first saw it.. a fantastic show…I now have it on dvd… my dad came to New Hampshire from Penryn in Cornwall and we grew up eating pasties and hearing about the countryside. Although I’ve never visited, seeing Poldark made me feel as though I had…my grand dad was a blacksmith and my ancestors were tin miners and farmers, exactly like the story line; they came from Helston and Redruth. Even my great aunt’s friend was a Miss Pascoe. Robin you are a treasure and our family loves you and the show. My dad had so much enjoyment seeing the series. Lovely family history, Stephanie–thank you. Cornwall has changed much since your father left–still out there on the edge, though and proud. Would love to see a Poldark series again; you have many fans.. Thanks, Charlotte–hope you enjoy it. I received your book (Amazon) and love it. The memories and updates, plus I wasn’t expecting so many photos and the hand-drawn map of Cornwall. A wonderful book. Now a question: I have recipe I’d like to tell you about. Where does one post these? I hope you don’t mind me putting this here. I am writing a book for the Civic Trust for Wales on Residents of Rhiwbina. This included writers, scientists, historians and the actresses Rachel Thomas and Angharad Rees who grew up here. We have had a call for contributions in the local press, and I have been very lucky to have been contacted by Angharad’s sister who is happy to help me with memories of Angharad and her father, Linford, who was a leading psychiatrist. I have read your book and was a huge Poldark fan. People in Rhiwbina were saddened at Angharad Rees’ early death. I wonder if you would be happy to share any memories of the making of Poldark or Angharad and to let me know if it is possible to use any photographs you may have. Copyright on photographs is one of the most complicated aspects of writing this. I have an academic background working in Cardiff University until recently when I retired for ill health reasons, thus this project. I have previously written a book on the Second World War in Rhiwbina for the CIvic Trust. If you are happy to share any memories with me I can give you references and background on the book including a reference from the Civic Trust if needed. I loved watching Poldark in the 70’s and I am now still watching it today. I just simply love it. Wonderful actors and fantastic locations. The best series I have watched in a very long time. Hi Heather–thanks for your kind words. It is good to hear you still enjoy it after so much time! because of regional Italian cooking, biscotti recipes vary, and this one is my grandmother’s way of making them…they are all from Abruzzo and Rome. It uses butter, anise and vanilla and isn’t as hard as some. It takes a bit of beginners luck to make them, but I’m sure you and your readers can master them. Thanks Stephanie. Naughty fare for diabetics! Place shortening, sugar and eggs in a bowl and beat until blended. Sift dry ingredients. Add half of the milk and half of the dry ingredients to first mixture. Mix well, then add the anise and vanilla and remaining flour and milk. Beat in.. Turn out onto a lightly floured board. Knead until dough is easily handled. Add a little more flour if needed. Divide in half. Make two long rolls (like a cylinder) about 16 inches long. Place on a greased cookie sheet. Flatten until about 3 inches wide and ½ inch deep. oven and place on a board to cool slightly. Cut in diagonal slices with a sharp knife. Place cut slices on the cookie sheet, cut side down and place back in the oven until toasty brown. 15-25 min…watch carefully do not over-bake. When cool, store in an air-tight cannister for 2 weeks or more, if there are any left.. You’ll be dipping them in coffee or wine and no one can resist them. 😉 Ciao! Lovely for holiday guests, so please get baking! Thanks for sharing these memories, Kim. I remember not liking the music at first–how wrong I was and how evocative it is now. Transporting even. I’m sorry to hear about your niece; very hard for an eleven year old to face this. She is at least fortunate to have an understanding family who are willing to research the condition. It’s in the interests of the family to do so of course because Diabetes is a genetic condition and her diagnosis may be a timely wake-up call for others. I count myself lucky to have been a witness to my mother’s experience with Type 1–I knew enough to take it seriously. Hope you find things to tempt her in both books. Could be wrong Robin, but I’m sure I saw you in a production of ‘Much Ado About Nothing’ around about 1976/77.We were all studying the play in our sixth form group and headed by coach down to Stratford-on-Avon to see the production. I had my little opera glasses trained on you. Well remembered, Valerie, I played sad Don Pedro. Judi D and Donald S again as a poignant older pair of lovers–Beatrice and Benedick. I annoyed Donald in one scene by juggling three oranges! My friend and I were both madly in love with you in the 80’s when we attended your book signing event for “Making Poldark” in upstate NY. As we stood in line waiting to meet you, she asked me nervously, “What was the name of the play where he sang?” and I said, “She Loves Me”. She kept asking me every few minutes, “What was the name?” And I kept telling her “She Loves Me, She Loves Me”. Finally, when she reached your table, she said to you “I loved you in Me and My Gal!” Your very kind reply was, “Sorry, wrong actor.” She was horrified!! I was hysterical. We laughed about that for years! She recovered enough to take a picture of me handing you some photographs I had taken of the Tintagel Old Post Office in Cornwall. I still have your autographed book and that picture of us safely tucked away in a fireproof safe with my best memories. By the way, my dogs names were Ross Poldark and Drake. Sadly, they are no longer with us, but my VHS copies of Poldark still sit on my bookshelf. Thank you for years of enjoyment! Can’t wait to get the cookbooks! Having had an evening ahead of me with no distractions I opened the 1st DVD of the first series of Poldark for an evening’s viewings. What a magical evening. I’d forgotten so many of the details of the story it was like watching it for the first time. I fell for you all over again – what a dashing young captain you were (I’m sure you’re still ‘dashing’ but, like the rest of us, not so young!). Looking forward to many more hours of happy viewing. Thanks, Hilary–my but it’s a while ago. Happy though that it still grabs your attention. I’m not sure it was the programme that grabbed my attention – rather one of the actors (mentioning no names)! I now work with diabetics (retinal screening) and so am very interested in all your posts about diabetes. Your recipes are great as well – if only more people would think of their diet in the way you do. Thank you for posting about the new Poldark Drama and the New Cast, but for sure there will always only be ONE Cap’n Poldark, and that is Robin Ellis. A great part for a wonderful actor. I have both original Series DVD’s and it’s a huge source of joy to me….my Dad took the train from nr Falmouth up to Liverpool, on a ship over to the Isle of Man and to Ireland, and then on to American as a young lad, but his heart always belonged to Cornwall. I can’t wait to see you in the coach playing the Rev….be sure and arrive before the storm hits in Truro. Best Wishes always to a marvelous actor and human being. Thanks Stephanie, for your very generous comment. I didn’t make it clear. I play the clergyman, Halse, who was in the coach a the start of the first series of Poldark but that scene is not in the new series. oooh well I’ll look forward to seeing you in the new edition whatever your role. Best Wishes – and watch out for Capt McNeil; don’t want to see you under the floorboards again. As I said in my other blog on another page of this site, I am re-watching Poldark for the umpteenth time. I was reminded in the last few evenings of several great scenes with Jud Paynter in them last night. It has occurred to me that this role played by Paul Curran gets overlooked because he plays such an unsavory buffoon. Far from the romantic Lead or the handsome Doctor or dashing Scots Captain, (sigh, sigh, sigh) he actually plays a role I think is very difficult as it is so far from himself in real life. (of course, I’m sure you are just like Ross Poldark – LOL). I think he is one of the best and most overlooked stars of that series. And he is brilliant! I presume long gone from us by now, I just wanted all the fans out there following this blog to remember this marvelous actor and performance which added so much to the enjoyment and success of the series. A toast to Paul Curran – dirty, grimey, smelly but very colorful – Jud. Paul was a wonderful actor who I was thrilled to be acting with. He had been one of the original band of actors who joined the National Theatre under Olivier at The Old Vic. A group I was in awe of. He was a very generous acting partner and a lovely man. Here’s to you dear Paul! and thanks for the tribute, Theresa. For what it’s worth, on DVD menu of one of the Series 1 dvds, there are only handful of cast bios. (They’re very skimpy with the Special Features!) They include ones for the four principals, and then one more: Paul Curran. I remember being (pleasantly) surprised that he was included, as perhaps there were other actors who may have uttered more lines that were not included. So I assumed, then, that they must have included Paul Curran simply based on popularity or reputation. I agree with your observations regarding Jud.He was a wonderful earthy foil for the more intellectual and romantic aspects of the story.The texture of the drama would not have been the same without him. Io ho amato poldark da ragazzina. Vorrei sapere se il libro e’ uscito in Italia con la traduzione. Used to watch Poldark as teenager, me and my late mum never missed an episode. I totally fell in love with Ross as I’m sure everyone did. I bought all the books after that and have read and re-read them over the years. I talked about Poldark so much that my daughter bought me the series on DVD 5 years ago. I’ve only recently discovered ‘making Poldark’ and have bought a copy on ebay from a guy in Truro it’s signed he says by Robin himself. It will be a treasured procession. Can’t wait for the new series. In the Spring, perhaps, Eileen. Hello, Robin, I just ordered “Making Poldark” and can’t wait to read it. Thank you for writing it for us. I was sorry to learn of Ms.Reeses passing. She was a perfect Demelza for you. Also, can you tell me what happened to all those beautiful costumes from the show? Thank you. Hi Donna–I have just recorded an audio version–should be available very soon. The costumes–they were beautiful you are right–went to other shows I guess. I followed your Poldark saga as a young adult of 25 when it originally aired and loved it then and love it even more now that it’s on DVD and I can pull it out whenever I want to relive the saga. Poldark was and will always be my favorite literary miniseries. I cannot tell you what a thrill it is to finally have the chance to express to you how much I enjoyed your portrayal of Ross. You made the role yours as much as Sean Connery made Bond his. Now there’s talk that you will be in the new series being filmed and I know you cannot discuss characters but I will say that I think it’d be great if, after doing the hero you got the chance to do the villainous elder Warleggan. Just in passing, I am a composer who has written a piano concerto in the Rachmaninoff tradition that is coming up in the ranks. It’s on my YouTube channel if you ever have a few minutes to kill some wintry rainy evening. All the best to you and am eagerly looking forward to seeing you in the new series. Thanks, Joe–I’ll definitely check out your piano concerto. I saw you on the ‘One Show’ this week and it brought a very happy memory back to me. I read all the Winston Graham novels when I was young then I watched ‘Poldark’ on the T.V. and was ‘smitten’, as were many other female viewers. When you were at Stratford in ‘Much Ado About Nothing’ my kind husband took me to stay there so that I could see you in that play. Afterwards we went to ‘The Mucky Duck’ in the hope that I might see you in there as I had read that it was the pub which actors frequented after their performances at the theatre. To my amazement and delight you came in with some friends and even more so when you came and sat next to me! Thank you so much for being there because I have told that story more than once and my children heard it a few times. At the time I didn’t speak to you because I thought you needed to have a normal life outside the theatre, I think gave the appearance of normality. Christine you should have said hello! Actors like a little recognition. Anyway thanks for your comment. I enjoyed last night and we are going to watch the show tonight–here back in France! I have been looking at all your ‘posts’ and I am so glad that you have had such a happy and creative life since ‘Poldark’, especially seeing you with your gorgeous wife and a lovely life in the south of France. I came for a fortnights holiday staying just outside Carcasonne in 2004 in October and I thought that the climate was wonderful. If only I’d known then I would have said ‘Hello’ in the pub! I still love the theatre and I am a great fan of Mark Rylance, I saw him in Chichester in a play which he wrote called ‘I Am Shakespeare’. I am fortunate to live here, we have a great theatre. I am looking forwards to seeing the new version of ‘Poldark’ and I must read the latest books by Winston Graham, and yours. I hope you enjoyed watching yourself on the ‘One Show’, I thought you were brilliant. Thanks Christine–I certainly enjoyed doing it! In browsing through these writings, I realised I have a Paul Curran memory you might enjoy. His wife worked with my mum in the 70’s. At a Christmas party where everyone was becoming very jolly, a small group stood around, drinks in hand with big “there is an actor in our midst” smiles on their faces. Suddenly my mum’s boss noticed a very beat up trilby on a chair. “Oh, I should sit on it,” she said and she gracefully did so to the amusement of all. She rejoined the group looking quite proud of herself when Paul promptly walked over to the hat and put it back on his head murmuring something like, “Oh, you found my hat!” My mum’s boss sobered up pretty quickly after that. Lovely story, Joanne. Paul would have had a smile on his face too! The imminent arrival on our screens of the long awaited remake of Poldark brought back memories of watching the original with my mum. I was 24 when the first series was on and I was completely in love with Ross! Well, who wasn’t? Anyway this prompted me to do a bit of digging and here I am! It’s lovely to know that you have such a happy and interesting life, I often wondered what happened to you! I’m intrigued to know why the third series didn’t happen so I’ve ordered your book and a cookery book too. Your recipes look great! Having found you again I’ve signed up to follow you, well my husband says I need more hobbies! I’m sure Aidan Turner will be good, just not as good as you!!! PS you’re still a good looking guy! Hi Sue and thanks and welcome! Watched the first episode last night and the jury’s still out. He’s certainly no Ross and she’s no Delemza. In fact none of the cast have lived up to my expectations. Perhaps if they didn’t have such an amazing act to follow then they’d have a chance but I shalln’t go out of my way to watch any more episodes. Give it another chance, Hilary! The world’s gone mad, everyone’s talking about Poldark!!! Well, I thought it was very good and thoroughly enjoyed it! I think I’ve always been in love with Ross (or Robin?!) and it’s such a darn good story! I think Aidan makes a good job of it but I’ll always prefer you, Robin, somehow you were Ross Poldark! I shall still be glued to the tv on Sundays though and am looking forward to seeing you in it! I watched The One Show on IPlayer during yesterday afternoon (there’s something of a Poldarkfest going on at the moment) and it was great to see both Rosses together although the Aidan v Robin public ‘vote’ with the photos and kisses was tacky in the extreme! Actually, I can’t stand The One Show, it’s just so random, I mean they invite you on and out of the blue you end up judging alpacas and hamsters! My books arrived today so I’m looking forward to reading and cooking. My husband is bemused by the ‘Poldark effect’! He didn’t see much of the first series, he was only 19 at the time and we didn’t meet until 1982. He enjoyed it but didn’t think it was ‘that good’! Poldark is not ideal for 19 year olds! Especially 19 year old boys!! Although Aidans version is excellent ,I cannot wait for my real Rossfest. Now do I still have enough money for some healthy eating cookbooks? Thank you, Brenda, for that lovely message and welcome! Hello Robin. I wanted to message you (for the first time). Saw you on Loose Women, how lovely. You are so gracious about the new series. I looked forward with great anticipation to this remake, but sadly was rather disappointed on several counts. I will not go into detail, but many of the characters were miscast. I have read all the books, several many times over, seen the series at least six times over the last 40 years, and read your books on the subject. Winston Graham drew his characters very finely and this has been overlooked in this production. The original series was a masterpiece of casting, a true dream cast. Of course many of the cast were distinguished actors of stage and radio as you know. Secondly I was surprised at the relative paucity of the script compared to the rich wall to wall dialogue in your series. Thirdly I feel that Aiden Turner’s chest baring is superfluous.On reflection I suppose this is what puts bums on seats for the younger generation nowadays. You will never be bettered in the role. Some productions will never be surpassed, such as the 1990’s Pride and Prejudice, Kubricks 2001, Schaffer’s Amadeus and Poldark with Robin Ellis and the delightful Angarhad Rees.All classics to treasure. I will keep watching the new series: however you will never be forgotten by countless thousands. We are all looking forward to your cameo part next week! Many thanks for the pleasure you have given over the years. Dear Rose–thanks for those generous comments. Just as well there were no internets, blogs or emails I might have been locked up ! it transports us to another world ! Has the remake of Poldark enticed you back into the world of acting, fame and the older thinking womans hearthrob once more ? Did you ever leave it ? Thank you Brenda–so glad to hear you liked the book. It should be out in audio in a week or so. The Poldark books have already been recorded I’m sure but I forget by whom. Just finished reading the updated version of “Making Poldark”! It’s a long time since I read the first one and I really enjoyed it! I love the chapter about Meredith, so romantic! I’m enjoying the new series and looking forward to seeing you in tonight’s episode! Great to see such good reviews amidst the (justified!) interest in Aidan’ s many attributes! We’re both enjoying your cookery book! I did the guinea fowl last week and it was lovely! First time I’d cut up a whole bird but it was fine! Thanks, Sue–glad you enjoyed it and the guinea fowl. My husband and I have been recently enjoying the Poldark series all over again. The first time, I was taken in by the whole story but with this second viewing (20yrs later) I am more aware of the talent of all the actors and can see why the first viewing was such a treat. Thank you for sharing with us, for lack of a better phrase… the “believability of the character” in your work. Not that we see you and Angharad as Ross and Demelza, you obviously are/were real people with real lives… you did though make the characters real for us. I enjoy the confident and definite speaking of your lines and the subtle mannerisms you brought to Ross’ character personality, which lead me to think you were enjoying what you were doing as an actor. As a viewer, this is always nice to see so that even despite the deviation of story lines, the character remains consistent and sincere. Thank you for that. Poldark holds up well, even with all the ’70’s television filming styles of the time – zoom in close-ups, overhead shadowy lighting (which I love about that era), the feeling as if it were a play and not a movie (which I also love), the different films for inside and outside shots, etc. etc. The work you and Angharad (and the whole cast) did holds up well, holds up well. It’s nice to see what you are doing now, I’ve been enjoying your site and will check out some of your recipes, I have low blood sugar issues and my grandmother was a Diabetic (two shots a day). Even though I take care of myself the low sugar warning signs are more frequent lately and I’m told a Diabetic diet would be a help. Thank you Carine for those very kind comments–much appreciated. Angharad and I did enjoy it and i look back with affection on those times. I call the way I/we eat a way of eating! It promotes the idea that it is a permanent way not just a diet–which always has a temporary air to it for me. You are on the case and that’s half the battle. I hope it is alright to respond again. Yes, I fully agree. I have always been a firm believer that diet is all about how and what you eat. I will look for both your cook book and your Memoirs. Perhaps I’ll cook a meal from your book and read your memoirs as it’s in the oven… Did I read correctly, is your memoir on CD? Thanks for the encouragement, that was nice. It does some days seem like a battle to keep putting food (even thought it is good foods) into this small framed body ALL the time to keep things level. But I’m in a good place with everything. Wonderful to see you on last night’s show. Thanks Isabel–I’m enjoying every minute! Thanks Susan–you have a good ear! I love your critique of the new Poldark on delightful dragon Isabel. I would wouldn’t l, because I’m your mum! Nevertheless l really think it’s an excellent review of the new series. Totally agree with points made. Very insightful. Hello Alexandra–and thank you for those kind words. Hope to see you next year on one of the workshops. I have long been a fan of the original production of ‘Poldark’ and in particular your portrayal of Ross. It has been a delight to – yet again- watch that original production. I owned the videos and now the DVDs . They immediately take me back to the 70s and the excitement of waiting for the next episode. Such a joy! You will always be ‘Ross’ to me. I dragged my long suffering husband to Stratford upon Avon to see ‘Much Ado’. We had a running argument about your height- I remember writing to you and you were good enough to write back and settle the argument!! I have so enjoyed seeing you on TV over the last few weeks. It has brought back those lovely days. The new production is very entertaining- but a different ‘beast’ to ‘my’ Poldark. I look forward to reading your revised ‘Making Poldark’ – the original having graced my bookshelf for many years. My thanks for all those happy memories and good luck with your cooking!! Hi Fran–thanks for this–very kind. I remember Much Ado with Much affection and the rest of that season. My height has with any luck remained the same! It’s a pleasure to be able to speak to you after 40 years!! My name is Giles Hill and I was an extra in 1975 while the filming took place at Doydon Castle,Polzeath.I was a mere kid at the time,five years old but I have wonderful memories of the small part my brother and I were involved in on the set.My fondest memories are of being sat in the make up trailer at Doydon Castle,and my brother being turned into an urchin by the crew,with me sitting next to him awaiting my transformation,which I state wouldn’t have taken a great deal!! Anyhow,within a few minutes Demelza came into the trailer and saw I was waiting to be made up,and asked the make up artist ‘can I do the make up on this little chap’,as to which the lady said ‘yes by all means’ so Angharred made me look an urchin,and by the scene she did a wonderful job! The scene we were involved in was the one where cap’t Poldark and Captain Blamey find Kerens body,murdered by Mark on the cliffs,and we are the little urchins watching over you….I’m the blonde one,hence not so blonde now!! These are wonderful memories of a wonderful series,which we are so proud to have been involved in,and am sure will continue for countless years to come,for us and all.The current series is again superb,and it’s great to see you having a the role of Reverand Halse,and hope to see you in any series 2..which I gather is in the pipeline! That’s a lovely memory Giles and typical of Angharad to make it all fun. I remember you Cornish extras as being 100% committed; you added so much to the series. An incurable romantic I am enjoying the new ‘Poldark’ series and look forward to the next episode every week as though I am watching it for the first time. I must also say that in re-watching the original series I don’t think it seems at all dated, the sign of a good production and well written story. Since I last contacted you I have read your book, ‘Making Poldark’ (not the updated version which I will read at some point) and read that you and the crew spent time in the countryside around Chichester. I am writing to ask you if any of the filming for ‘Poldark’ was done there when Cornwall was so busy with tourists? I enjoyed your book, it was written in a conversational way, a very enjoyable read. Many thanks for your acting and writing which have brought pleasure to so many people. Thank you, Christine–appreciate your kind comments. Yes, as far as I remember it was impossible to film in Cornwall in the summer–too many grockles! What a fool i was to think that ! ” A Little Chaos ” Kate Winslet and Alan Rickman ,beautiful, thoughtful piece. Lovely Brenda–thank you. Glad you’ve discovered the cookbooks. Do you have a process whereby your Making Poldark book could be personally autographed to the purchaser? Has there been another sighting of your Siberian Hamster Basil about your property? My wife and I would love to attend a cooking session in the future and hope that these delightful and educational seminars will continue for the next several years at least. Not at the moment–but thanks for asking and like your music-making. Welcome, Mark–hope you find something you want to cook! When Poldark originally aired on my local PBS station, I quickly became a groupie. One Thursday night there was a thunderastorm and we lost our power. I was unable to watch that week’s episode. Sadly, the series never aired again so I had my lost episode to haunt me. Finally, my waiting ended when the series was released on DVD and the mystery was solved. My husband never saw the series and now I have him giving it a thumbs up. I have watched this so many times…it has kept me company on many long nights when my husband was travelling. My regret is that the series did not continue. I would have enjoyed seeing what happened with Warleggan following Elizabeth’s death, the ongoing romance of Dwight and Caroline…etc. Sadly, many of these wonderful actors have moved onto the bigger stage in the sky. Thanks to all involved who made this wonderful saga come to life…you have given so many of us many delightful hours of entertainment. On another note, I am a Type II Diabetic and am about to check out your books…only downside is I don’t eat meat. So wil have to find adaptations that will work. Hello Katrina and thanks for your kind words. The books have lots of non-meat recipes that might be of interest. hey describe the way we eat everyday here. Okay, so I’ve watched the first two episodes of the new Poldark (in the US). The cinematography is breath-taking, acting great, directing very good but it doesn’t grab. The story’s there but not the passion. It’s like watching a really good performance compared to being surprised and doing a double-take. Your production had less money, paltry sets and I’m sure, less time but was so much more superior. Recently there was a picture of you and Aidan in military garb on Facebook. To me, it looked like you filled out the uniform and Aidan was a kid playing dress-ups. Sorry, but that’s what I feel. You ARE the only Poldark!!! The 8 parts are half the first Poldark series (16). So the adaptation is using the same format–4 episodes a book. First I want to tell you that like so many countless others, I am a huge fan of your portrayal of Ross Poldark. The “new” Poldark is very good and Aidan Turner is wonderful, but you are the definitive Poldark for me. I am sure you probably won’t remember this, as it was many years ago, but I briefly met you in Louisville, Kentucky, when you were there promoting the (I think) 15th anniversary of Masterpiece Theatre. I couldn’t believe it when I read in the Louisville Courier-Journal that you were coming to Louisville for the promotion (I kept thinking, “thank you, God” over and over in my mind! ).You were at the beautiful Brown Hotel in Louisville for a “meet and greet” type of thing. I was thrilled to meet you, but was uncharacteristically rather speechless at meeting my big crush, “Ross Poldark”. You were very kind and charming and lovely about letting my friend take a picture of you and me together (I still have it, of course). I bought your Making Poldark book and when you asked my name (to autograph it) and I said, “Sarahbeth”, you excitedly said that that was the name of your girlfriend’s favorite restaurant in New York for breakfast! When we were taking the picture you said that I was about the size of Demelza (I am 5’3″) and of course, that thrilled me too! I just recall how lovely and warm you were and I will never forget it! When I was leaving later you called out, “good-bye, Sarahbeth” and believe me, that was a thrill that you had remembered my name. I am now a grandmother, but the memories of meeting you, a true gentleman, will always stay with me. I am so happy for you that you have a lovely marriage, gorgeous home and success in helping people with diabetes still eat well and enjoy life. Hello Sarahbeth–lovely to hear from you. I was in Louisville, as I remember, to promote the second edition of Making Poldark. I’m glad you are enjoying the new go-round of Poldark and Aidan’s Ross–huge success in the UK. Winston Graham would be thrilled. Thank you for your good wishes and congrats. to you on your “grandmother” status! Thanks so much for the lovely reply, Robin. Best wishes on your continued success with your cookbooks. You have probably heard this over a thousand times, but I was a very devoted fan of the Poldark series in the seventies. I remember one Sunday night when a few friends were visiting me, when I said “we have to watch Poldark.” They were not familiar with the show and sort of made fun of me for my interest in “old-timey, boring entertainment” —or words to that effect. The episode was the one when Demelza goes to the Bodrugan’s party. I said, “How do you like that for a wild party? Not so prim and proper, right?” They were hooked, and became Poldark fans also. We have also read all of the Poldark books. Several years ago, when I was sending in my donation to channel 13 in New York, which broadcasts “Masterpiece Theatre”, they asked for suggestions from viewers as to what they would like to see, and I wrote, “Please bring back Poldark.” Apparently others made the same suggestion because a few months later, they did repeat the first series of Poldark, minus unfortunately, the original host of Masterpiece Theatre, Alistair Cook, who offered many insights about Cornwall and the time period of Poldark. I loved your portrayal of Ross and all of the other characters, good and bad in the original series. I am enjoying the new series also, and I am so glad that you are a part of it! I look forward to reading your book, Making Poldark, and your cookbooks also!! Best wishes to you for your continued success!! Hello Sandy and thank you for that comment. I’m glad you are enjoying the new go-round. I am enjoying being a part of it. I have just finished readling all the Poldark books again in one hit. They were just as wonderful as I remember them first time round and I could still hear your and Angharad’s voices in the characters, even in the later books when Ross is in his 50s. I can even picture him looking as dashing as he did when you first portrayed him and he looks much as you do today. There can’t be many actors you can say that about! Now a question. Did you follow the saga right to its conclusion (I suspect some actors want to distance themselves from a character as soon as they stop protraying them) and if so did you feel that the way the story went was what you would have liked for Ross and Demelza and their children? Hi Hilary. I enjoyed reading Bella Poldark very much and loved the fact that Ross goes to see her perform at the Old Vic-a theatre I have visited many times. I have never felt like distancing myself from Ross Poldark–he has been such a positive in my life! My wish is a new show could be mounted exploring Ross growing older, with you starring. It’s truly sad Demelza would need to be re-cast, but getting as many of the original cast would be great!!! Again, my intention is not to be snarky or unpleasant, I’m just telling the truth. Your production was and is much better than anything out there!!! And I applaud you and all involved in your production!!! judelyod. My sentiments exactly – see my post above yours! If you haven’t read the later books you really should. The historical information in them is wonderful and the characters sit so well into the setting. I could just imagine Robin and Angharad as the older Ross and Demelza – I cried when Ross cried at the Battle of Waterloo, I shared Demelza’s anguish and worry as she and the children fled from Paris, I felt for Valentine when his only real friend was Butto (and what a mixed up young man he was!) and all the others happenings were so real because I could see the faces of the characters. Robin – your portrayal made the character come alive. In fact all the actors from the first series did the same. So are they going to make a series out of this? Please? I totally agree with judelyod!! I live in the U.S. and never knew anything about Poldark until I was staying at my son’s home in 2012. He was starting a new business, and I went to help him. However, some of the days, there was nothing I was required to do, so I started watching movies on Netflicks to help the time pass. Then, I found Poldark and I was hooked!!! I couldn’t stop watching it!! I loved you and all the characters!! I have watched the new Poldark, and Adian Turner is a doing a good job, but you are the true Poldark!! For me, not only are you handsome, but your voice is what had my attention!! I have recently started reading the books….your voice is who I hear when Ross speaks!! Also, I bought your book, Making Poldark on Audible, so I love having you read it to me!! I found the book extremely enjoyable and full of wit!! Thank you, Sheryl for your generous and kind words. I’m glad you are enjoying the audio book too. After reading everyone’s comments I feel compelled to say something about a series that was and is very important to me. I read the first two Poldark novels right before the series aired in Canada on the CBC. I was in high school, aged 17, and the show came on just before midnight here. I sneaked into the living room every Tuesday to watch it with the sound turned down, so I wouldn’t disturb my sleeping parents. They found out anyway but never stopped me from watching. My aunt enabled my addiction by buying me all of the books that were in print then and continuing to buy me the new ones as they came out. I have the final one in hardcover. The paperbacks are a bit worse for the wear now, but I still have them! Must re-read them soon. I never did see the second season of the show. If it was aired here I didn’t get to watch, but don’t remember learning that it was on. I just purchased the DVD of that season and will begin watching shortly. I adored Poldark and, like so many, had a major crush on you and Ross. Loved the entire cast of the series. I remember watching my favourite comedy ever, Fawlty Towers, and realizing that you were in the first episode! Thoroughly enjoyed every moment. The new series is such a treat. It brings back fond memories. I don’t compare the two series and enjoy them both on their own merits. Aidan and Eleanor are both very good in their roles, but I do confess to being more emotionally attached to your and Angharad’s performances. It says something that that attachment is just as strong 40 years later. Congratulations to you and the entire cast and crew for creating something that has stood the test of time. That’s very special. I will be purchasing Making Poldark this coming week. Can’t wait to read it. And, as a hypoglycemic I am interested in your cookbooks and will be buying those as well. Healthy eating is something we all need to do! Thank you for your kind words, Brenda and sorry we kept you up! I hope you find the cookbooks helpful–so good to hear you are taking care of your condition. Colin was a great talent. I remember filming BRH vividly and admiring Co;in’s boldness as an actor. I heard Meredith on Radio 4 on Saturday morning talking about your first ski triip. I’m sure Ross would have been game for it so glad you persevered. Her report of you asking if there was time for one more run at the end of the week is one I, and I’m sure many, many skiers can relate to. You obviously got the bug! My husband didn’t start skiing until well into his 50s and I took it up again after having a major hip replacement. The thrill of whooshing down a mountain on beautiful white snow with clear blue skies is hard to beat. We are planning a tour in September. Fantastic! I hope you’ll make it to Los Angeles. will that be the UK as well? Thanks Stephanie–we had a wonderful time. What a lineage you have–I envy you! Hello Robin, Thank you for saying that! I guess the English & Italians got along at some point in time 🙂 My parents met here in New Hampshire in the 1930’s and together until my dad passed in 1992. I’m another American “child of immigrants”. I’m still getting chemotherapy here in Boston, MA and need to watch comedy a lot, so the other night I put on a dvd I rec’d for Xmas: “Fawlty Towers”…and YOU were in the first episode! What year was that? Love the clothes, plot and of course the laughs. John Cleese; how can anyone keep a straight face with him around? and Prunella …she is just classic.. those wigs and that voice..how did you keep from laughing?..another great show…and I really enjoyed seeing you in it! ;) You were terrific. It is a tough process you are going through, Stephanie; in very good hands in Boston I imagine. You are right Fawlty Towers still stands up and is a guaranteed laugh fest–I’m so lucky to have done it. I’m impressed with your comedic talents. I didn’t realize that actors could do comedy so well. 🙂 Working with that cast must have been super-laughs. Thank you again, yes I go to a Harvard-affiliated cancer hosp in Boston and trying out a new medicine soon. On a happier note, are you interested in my grandmother Tresidder’s pasty recipe? The original from Cornwall. 🙂 Dad said the men would take them in their lunch pails to the tin mine and keep them warm on the sides of the melters. I’ll bet when it came time for noontime “dinner” the aroma must have been tremendous! An early English census says my great-great grand dad was a “tin miner & farmer” in Helston. I still have a vegetarian cashew chili recipe for you also. Have to locate it! I always recognize your voice whatever role you play…ever since I watched the original Poldark…more than once!. A few nights ago, we got a library dvd of The Trial of Lord Lucan…there you were…as an attorney..in the courtroom…fancy wig and looking very proper. I guess the look came naturally to you in Poldark II. 🙂 I had never heard of the Lord Lucan mystery prior to this version; it’s quite a tale. Remember me–Barbara Brink? I hung out with you and Meredith along with Fergus Fleming in the late 80’s. I will be buying your book. I learned about it from my two daughters who go to Brown U and saw the poster in the bookstore. Can’t wait to read it. Will you be touring at all in NYC? I could put you in touch with the ladies who run the book program at the Colony Club. Sorry for the delay, Barbara. Yes of course we remember–how nice. Shame your daughters didn’t come and say hello in Providence. We recently went to show with Lucy Fleming and Simon Williams here. I remember good times in late 80’s with you, Meredith and Fergus Fleming. My daughters both go to Brown U and alerted me to your book tour as they saw a poster for it at the Brown Bookstore. Can’t wait to read it. If you are thinking of promoting the book in New York City you might like to be in touch with the ladies who run the book program at the Colony Club. Happy to connect you to them. I tried your Cauliflower ‘chops’ and they are now a great favourite with family and guests. Aprops of nothing I thought you might be interested in these totally useless facts. Since birth registrations became organised in 1839 in England and Wales and 2006 there have been approximately 800 births registered with the first name DEMELZA although the name doesn’t appear in the register until 1951 (in Cornwall) and perhaps unsurpsingly 438 of them were between 1975 and 1980. One child has the surname ROSS! There are no births or deaths registered with the surname POLDARK. There is, however a marriage registration for a Poldark in 2003 – no prizes for guessing her first name. What a master Winston Graham was for names – two truely Cornish sounding names that appear to have come from nowhere (although there was a lady born in Warwickshire in about 1826 with the middle name Demelza). I have a vague memory of being told that DEMELZA came from a village of that name. Maybe that was Warleggan–which indeed sounds like a cleverly made up Cornish name. Demelza and Warleggan were named after the two Cornish hamlets. For years the sign that inspired Winston Graham could be seen on the road traversing the Goss moor but I think it is no longer there. He observed it and decided that that would be a good name for his heroine, on his trips to Cornwall. Winston Graham claimed that the first Demelza was the daughter of the writer Denys Val Baker who was editor of the famed Cornish Review among many other things. She was born in 1951 but seemingly another Demelza was also named in 1951. Demelza Val Baker set up a nightclub in Penzance in the 1970s and for years the sign could be seen very large indeed in the town.